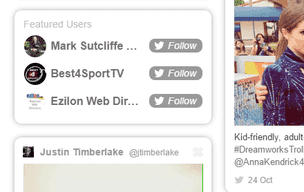 Feature your twitter on twiends and boost your exposure. We'll promote you to the large number of people that join twiends every day. We don't sell followers, we sell display advertising, and we've been doing it since 2009. You can display yourself to everyone, or only the countries you choose. We actively moderate and inspect every user that joins twiends every day. We're here to assist 7 days a week. We answer all queries within a few hours, sometimes faster. Profiles that post graphic or inappropriate content are removed by moderators within a few hours. We provide daily stats showing how your displays are being used and how many people have followed you. You decide exactly how many displays you want to use each day. Speed up or slow down as you want. You have full control over your promotion, and can stop, pause or resume payments at any time. Profiles without a profile picture are not allowed to join. Newly created profiles are limited. 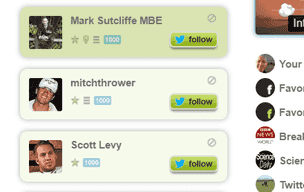 We will feature your profile on the home page, where people discover and choose who they want to follow. You can also choose to feature yourself on the blog, the learning pages, and on user pages. * Disclaimer: Please note that we can't guarantee specific results as they do vary for each user. Your actual results may be higher or lower than the examples provided below. "I've found the support and follow up on any questions exceptional and the fact it's all about crowd sourcing follower growth is even better. It’s critical for a genuine social media presence these days." "I love how simple and easy it is to use Twiends to find new people with similar interests to my own to follow. The service has helped me connect with folks from all over the world, and I've seen impressive results using it." "As soon as I acknowledged that I sent through payment in error, twiends jumped to the rescue and immediately refunded my payment with zero hesitation. Thank you, Twiends." "As a consultancy we find Twiends is a unique way of attracting the right kind of quality followers, quickly and in a cost-effective way. I would highly recommend Twiends to brands that want to get traction in their markets." "When I started with Twiends about three years ago I had about ten followers. Today I have a huge following thanks to Twiends. I have found it to be the most honest and lasting service of its kind." "Twiends has provided great additional exposure for my Twitter account. I've been on Twiends for at least a couple of years now, and it has helped me grow my followers massively." 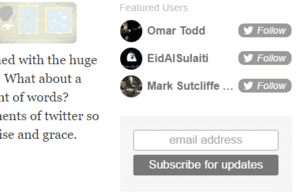 "Twiends is a splendid way to engage with followers within our niche. From the moment we started using the service we've found that our audience of relevant followers has gone up rapidly. What's more the service is simple to use and the staff couldn't be more helpful." "Part of my business is blogging and being able to spread my writing across social platforms such as Twitter. Twiends has helped me to get more quality followers. This has improved the number of retweets, likes and overall traffic flow to my sites. Thank you Twiends!" If you are not 100% happy with your trial then we'll refund your payment and stop it, no questions asked. There is no long-term obligation, you can cancel your recurring weekly promotion with us at any time. We will bill you weekly, and we can refund any unused displays for up to 2 months afterwards. We'll feature display you 1000 times a week.